As a contractor, what does “Diagnostic Fee” say about a company. “It’s something we have to charge!”. Customers want us to come out and tell them what the problem is so they can either do it themselves or have someone else do it for less. 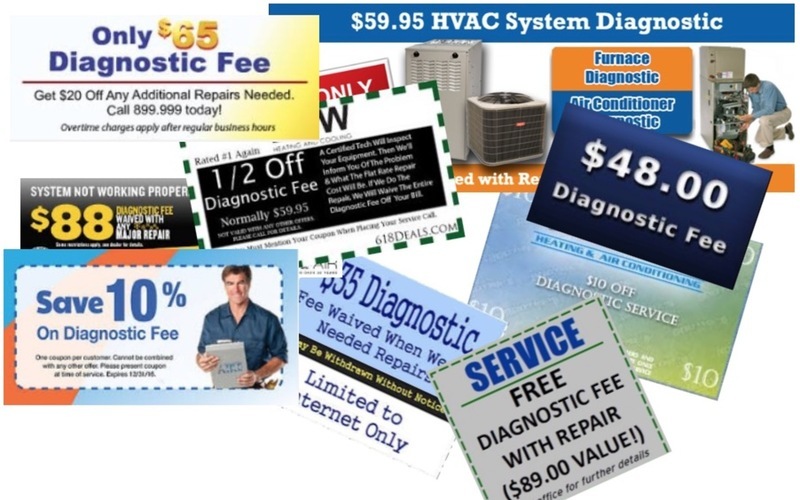 “Well, I’m not going to be taken advantage of, so I’m going to charge a diagnostic fee!” That will teach the customer to call me out for free advice! Let's see what the contractors definition of “Diagnostic Fee” is. Definition: A charge to the customer for the valuable time the customer takes up in a day where the contractor could be making more money with another customer. Many questions come to mind about contractors who charge this diagnostic fee. Some do and some don’t. One question I have to ask the contractors that do charge a diagnostic fee, do you charge this diagnostic fee because you're in a hurry? Do you charge this fee because you’re sending out techs that aren’t quite qualified? Are you charging this fee because you think it’s a way to earn extra income? So now, let's look at this from the customer's point of view. First of all, we can’t go into every house assuming that every single customer is going to waste your time or want to know the problem so they can do it themselves or call someone else to get it done cheaper. What goes through the customer's mind when one company doesn’t charge a diagnostic fee, and the other company does?? The customer says, “I have to call this company out because everyone else is busy and he’s going to charge a diagnostic fee, just to look at!” That is what the customer understands. First of all, the customer has never met you, they are inviting a complete stranger into their house who could have anger issues and they know whatever happens, it’s going to be a minimum of $85.00 plus. At this point, do you think the customer has peace of mind?? Why should the customer trust your company? The “kid” you sent out is only 20 years old, he has poor communication skills, he’s rude, he’s talking on the phone to the office, he has been here for an hour already with no resolve. Now granted this isn’t every single company out there. There are companies out there, be it, far and few between that could have diagnosed it within 5 minutes….without a diagnostic fee. Let's talk alternatives now to a diagnostic fee. First and foremost, did you hire your tech for their skill or for their attitude? I can’t agree more with Simon Sinek's quote, “You don’t hire for skill, you hire for attitude, you can always teach skills”. I totally understand that you do you have to hire for skills. So what is the balance? 50/50, 70/30, 90/10 for skill vs attitude? Whether you like it or not, you have to lean towards attitude. You also have an ad for either a licensed, or skilled tradesman. So skill is already there, they just need to fine tune their skills to your business practices. The more positive, friendly, respectful and courteous a tech is, the easier it’s going to be for them to sell anything for your company. Ya, go ahead and hire that 1 tech who has the personality of a donut and stinks to high heaven. But BOY is he a work horse! He can fix anything faster than 3 techs put together….just don’t get on his bad side, ask him questions or tell him not to smoke or cuss in your house. As a previous business owner...I’ll take my first option, courteous, friendly and respectful with less experience. Also, if you salesman/tech and your flat rate price books are set up properly, the diagnostic fee is already in place within the price book. Also keep in mind, if your flat rate price books are set up properly, you’ll see the selling machine come out from within your skilled tradesman. A few things to point out…. I would rather make a friend, leave on great terms and still be denied the job for whatever reason, because I made that person feel comfortable, talked them through the entire process and I know that in the future they will call me again for my thoughts and they would recommend me to others. Did I tell the customer what was wrong… NO! But my salesman/tech quoted the job, explained in great vague detail why he is doing what he is doing. The tech explained how long it will take to fix, the process to protect personal items within the house and how much it will be while showing them the companies flat rate price book so the customer knew they weren’t getting ripped off with some price this company grabbed out of the air. So, how do you quote someone a price without telling them what is wrong you ask? If you sat down long enough and took a deep breathe and thought about it, you would come up with the answer. You’ve heard that quote, “you're missing the forest for the trees”. Well, you are missing the bigger picture by charging a diagnostic fee. Please feel free to comment on our website regarding this blog article.